(Photo:© Peter Kenny)Rev. Olav Fykse Tveit, general secretary of the World Council of Churches, speaks to journalists at the United Nations in Geneva on Dec. 12, 2016. The leader of the World Council of Churches has joined Pope Francis in praying for the victims of several terrorist attacks over the weekend, including the latest one against Coptic Christians in Egypt which he described as intolerable in a place of worship. Rev. 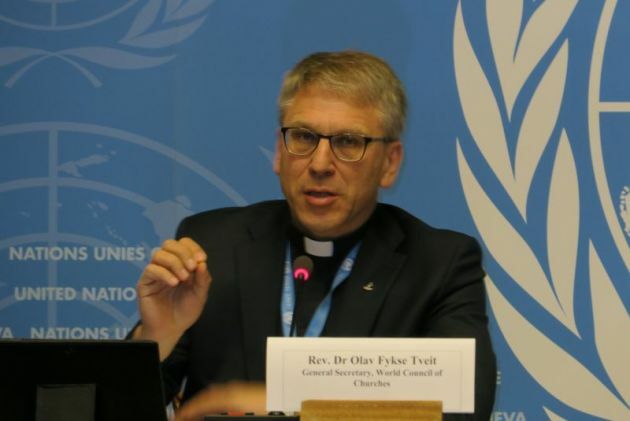 Olav Fykse Tveit, general secretary of the World Council of Churches, told journalists at the United Nations in Geneva on Dec. 12 that attacks on people at a place of worship like the bomb attack in Cairo at a Coptic church the day before are intolerable. In Egypt, a bomb near St. Mark's Coptic Cathedral in Cairo killed at least 25 people on Sunday morning; in Somalia, a suicide bomber killed more than a dozen people in Mogadishu the day; and in Turkey, at least 38 people were killed in twin bomb attacks outside a football stadium in Istanbul the preceding evening. "A bomb attack on the Church of the Coptics is as if there was a bomb attack in the Sistine Chapel [in Rome]," said Tveit at a press conference in Geneva. Nearly 90 percent of Egypt's 95 million people are Sunni Muslims and about 10 percent are Christians, most of them Coptics, who follow the Eastern Orthodox Christian tradition. Pope Francis had spoken out Dec. 11 after reciting his traditional Angelus prayer saying, "We also pray for the victims of some horrible terrorist attacks which have hit various countries in the last few hours." "There are several places, but unfortunately, unique is the violence that sows death and destruction. But the response is also unique: Faith in God and unity in human and civil values," said Francis. "I would like to express a special closeness to my dear brother Pope Tawadros II [the head of the Coptic Church] and to his community, and I am praying for the dead and the wounded." On Sunday morning, a bomb exploded in St Peter's Coptic Orthodox Church in Cairo, Egypt, killing 25 people and injuring 31 others, according to reports from local media and the Coptic Orthodox Church. Also on Dec. 10, in Nigeria, the roof of a church collapsed on worshippers at the Reigners Bible Church International in the city of Uyo, killing at least 160 people, according to news wire reports. The church was crowded with those attending a ceremony ordaining the church's founder as a bishop. Many in the country have called for an end to corruption that compromises construction standards, regularly putting people in danger. It has been a weekend in which tragedy and darkness seem to be on a crescendo, said Tveit in an earlier statement. "People gathered to worship should be able to connect with God in a place of dignity, protection and respect," he said. "People attending a sporting event should be able to have a sense of fellowship that is unmarred by violence." The weekend's sad events were a reminder that more than ever, "the pursuit of just peace is vital on every front" - individuals, governments, structures, systems, said the WCC leader. "We will forge ahead on a pilgrimage of justice and peace made stronger by faith, hope and love. The pursuit of what is just, and what is right, is more necessary than ever." Tveit noted, "The Coptic church in Egypt has experienced several times in the recent years that their members and worshippers have been killed and became martyrs of their faith. This event in Cairo today is a new grave examples of the vulnerability of the Christian communities in the Middle East. "This is a great concern for the whole world wide fellowship of Churches, and should be so who care for them and the mosaic of believers in this region."